Of the lot, however, only about four appear to have the wherewithal to run for the contest. The four are: Former Central Bank of Nigeria (CBN) Deputy Governor, Kingsley Moghalu of the Young Progressives Party (YPP), Gbenga Olawepo-Hashim of the People’s Trust (PT), President Muhammadu Buhari of the All Progressives Congress (APC) and former Vice President, Atiku Abubakar of the Peoples Democratic Party (PDP). However, despite the fact that there are many contestants, the battle is a straight one between Buhari and Atiku. This is largely so because apart from the advantage of financial muscle, the two leading candidates appear to be the ones with verifiable party structures across the country. Buhari’s APC has governors in 22 states, while the PDP has 13 states, leaving the All Progressives Grand Alliance (APGA) with one state. In Nigeria, men and material resources are needed to win in any election. Historically, this is the first time two strong candidates from the North will be running on two most formidable political parties in the country, thus making the contest an all north’s affair, just like the country had an all south affair in 1999 when two Yoruba, Chief Olu Falae and Dr. Olusegun Obasanjo, ran on the two most formidable political parties at the time- defunct ANPP and the PDP respectively. 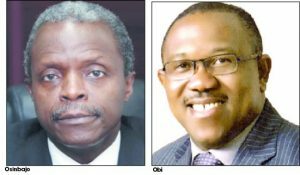 With the current scenario, Daily Sun gathered, all the other sentiments -religion, tribe and ethnicity – that usually influence pattern of voting in the North, in favour of any major candidate from the area will be mutually shared between Buhari and Atiku, thus making the contest a one too close call. Elder statesman, Tanko Yakassai, who is already in his early 90s corroborated the above fact. Yakassai, was former President Shehu Shagari’s Liaison Officer to the National Assembly. He said: “I am more at home with the present situation than the 2015 situation. Why I am at home is that the serious contentious issues such as religion, ethnicity, and sectionalism are now not part of the campaigns. In 2015, those three issues drove the campaigns because Buhari was from the North, was Hausa-Fulani and a Muslim. Jonathan, who contested against him, was an Ijaw man from the South and a Christian. In 2015 elections, all the major socio-cultural and political groups, including Arewa Consultative Forum (ACF), endorsed Buhari as its preferred choice. The only seemingly northern group that endorsed former president, Goodluck Jonathan, who was the PDP’s candidate in that election, was Northern Elders Council (NEC), led by Yakassai, a founding member of the ACF. 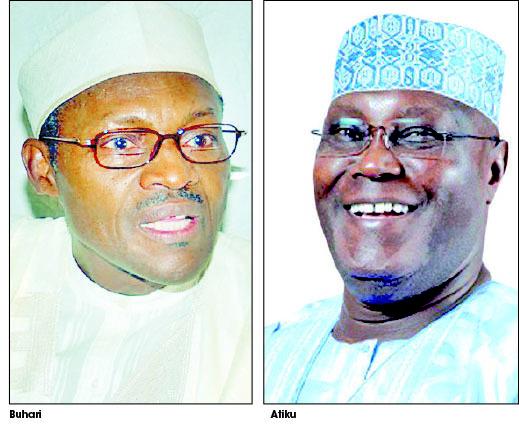 This year, both Buhari and Atiku appear to be enjoying equal proportion of endorsements in the North. For instance, once the Professor Ango Abdullahi-led Northern Elders Forum (NEF) announced its endorsement of Atiku, another group was put together, named Kungiyar Dattawan Arewa Initiative (KDAI), to endorse Buhari. The group’s position was read by General Paul Tarfa (retd), whose name has been sent to the Senate for confirmation as Chairman of the governing board of North East Development Commission (NEDC). Ironically, up until October 2016, NEF was still vehemently in support of the Buhari administration, to the extent that it publicly passed a vote of confidence in him at a time some Nigerians felt the government had derailed. But like Yakassai-led NEC then, KDAI too, investigations reveal, appears to have been hurriedly put together for the purpose of the endorsement, to counter Professor Ango Abdullahi-led NEF. However, ACF which endorsed Buhari in 2015 purely on the basis that Jonathan betrayed the North on the issue zoning, has gone ahead to endorse Buhari, ahead of Atiku, who played a prominently role in the formation of the group 19 years ago. Daily Sun’s attempt to find out why ACF, which has always claim to be a unifying force in the North will choose Buhari, ahead of Atiku was met with brick wall. All the senior members of the group contacted by Daily Sun either feigned ignorance of the position or insisted they would have nothing to add beyond what were stated in the group’s press statement, issued on Tuesday, where it said its endorsement of Buhari was among other things based on his performance so far in office and his integrity. But Second Republic member of the House Representatives and Russian-trained Medical Doctor, Junaid Mohammed, believes that all the groups in the North that are falling over each other to endorse the two candidates do not possess the democratic credentials to so do. According to him, “you cannot gather personalities, and use them to legitimise your endorsement of Buhari or Atiku. That is not my understanding of politics and that is not the way I play politics. I have never claimed to speak for the North, so I don’t know what the decision of the North will be. “And nobody can claim the arrogance to speak for the North, to the extent that if he said the North should vote for Buhari, they will listen to him. I doubt, if the North will listen. The North has never been a monolithic one. There have always been divergent views on issues about politics. Check the history. So it has been, so it is today, and so it will always be, till the end of time. Like the various groups, even the Islamic community in the North are equally divided. For instance, while North’s foremost Islamic group, Jama’atul Izalatul Bidi’a Waikamatus Sunnah (JIBWIS), one of the largest Islamic societies in Nigeria, Chad, Niger, and Cameroon, in January announced its endorsement of President Muhammadu Buhari for a second term of office, the Deputy National Leader of the group, Sheikh Sambo Rigachikun, who has more followership than the leader, called on all “well-meaning Muslims” to vote for Atiku, saying the PDP candidate has done more for the Islam and humanity than Buhari. Considering the prevailing circumstances, therefore, and in spite of the fact that both candidates are Muslims, pundits say, one of them will enjoy more support from the indigenous northern Christians than the other, just as the Muslims in the North will also favour one of them above the other. Buhari’s first entry into the presidential race was in 2003. But the first time he ever posed any serious challenge to the PDP was in 2011. In that contest, Buhari ran against Jonathan, a Christian and a southerner. In Kaduna for instance, the contest was fierce. Although, Buhari eventually defeated Jonathan in that election in Kaduna, the margin was slim. While Buhari polled 1, 334, 244 votes, Jonathan polled 1, 190, 170 votes. But in the final analysis, Jonathan won the contest, beating Buhari in seven of the 19 northern states and the FCT. The states are: Adamawa, Benue, Kogi, Kwara, Nasarawa, Plateau and Taraba. In the North, Daily Sun investigations reveal, politics is like war. But in prosecuting any war in the North, be it political or otherwise, religion and ethnicity play major role. These two factors may perhaps be responsible for why Buhari only post 12 million votes and above each time he runs against a southerner and a Christian. For instance, in 2003, which was the first time he was coming into the race, Buhari polled 12, 710, 022 votes against Olusegun Obasanjo of the PDP, who polled 24, 456, 140 votes. Buhari ran on the platform of the defunct All Nigeria Peoples Party (ANPP), which was in firm control of the North at the time. But in 2007, which was Atiku’s first time on the ballot, Buhari was PDP’s major challenger in that contest. Atiku was however not the PDP’s candidate at that time. Umaru Yar’Adua, a fellow Muslim and northerner, was the PDP’s candidate. In the end, Buhari only managed to poll 6, 605, 299 votes, against Yar’Adua who polled 24, 838, 063 votes. Yar’Adua, who was rounding off his tenure as the Katsina governor at the time, also floored Buhari, a fellow Katsina man in the state. However, when Buhari again squared up against Jonathan, a southerner and a Christian in 2011, he recorded 12, 214, 843 votes. But Jonathan carried the day with 22, 495, 187 votes. Again in 2015, when Buhari ran against Jonathan, he not only defeated Jonathan in the North, bur also he went ahead to win the contest for the first time, polling 15, 424, 921 votes, against Jonathan’s 12, 853,162 votes. Pundits however say, he may have won because of the crisis that hit the PDP, ahead of the 2015 contest. In the South-East, Buhari scored 198, 248 votes, Jonathan polled 2,464,906. In the South-South, Buhari had 418, 590 votes, Jonathan had 4, 714,725 votes. In South-West, Buhari had 2,433,193 votes, Jonathan scored 1, 821,416. In the North-Central Buhari polled 2,411,013 votes, Jonathan recorded 1,715,818 votes. In the North-East, Buhari polled 2,848,678 votes, Jonathan had 796,580 votes and in the North-West, which is Buhari’s base, and where he enjoys a cult following, he polled 7,115,199 votes, and Jonathan managed to poll 1,339,709 votes. Interestingly, Kano alone accounted for close to two million votes in favour of Buhari against the PDP’s candidate, Goodluck Jonathan. Ironically, the difference between Buhari and Jonathan’s votes was 2.5 million. In 2011, when Jonathan defeated Buhari at the time the PDP was intact, with Buhari running on the platform of the defunct Congress for Progressives Change (CPC), the margin was about 10 million votes. In Kaduna too, in 2011, when Hunkuyi and his group were in the PDP, the party won the governorship, but lost the presidential election to Buhari’s CPC with 1, 334, 244, to PDP’s 1, 190, 179. PDP had fielded Jonathan in that election. But in 2015, when Hunkuyi and his group joined the APC, the party, which fielded Buhari as its presidential candidate, PDP lost both the governorship and the presidential contests with wider margin. While Buhari’s APC polled 1,127, 760 in the presidential contest, PDP which again fielded Jonathan polled 484, 085. Daily Sun investigation revealed that there are some prominent members of the APC from the North who, out of fear of the “unknown,” may have decided to remain in the party. But it is unlikely if they will commit the same energy and resources they committed to prosecuting the 2015 contest for the APC, for the same party in 2019. Regardless, to win 2019, Buhari and his party would have to do more in the North-Central and North-East. Buhari’s closest political ally in Katsina, Senator Abu Ibrahim, admitted after Saraki’s exit in the party that APC would lose Kwara and Kogi in the North-Central and no more. Daily Sun investigations reveal that with Governor Samuel Ortom’s exit, APC’s chances of winning in Benue State appear slimmer. Also, because of the incessant killings on the Plateau, the state would pose a big challenge to the APC. Although it won the governorship in 2015, PDP floored it in the presidential contest in the same year. Since 2011, Buhari has never won Nasarawa State. This is despite the fact that his party, CPC, at the time won the governorship in the state. Today, there is nothing on the ground to suggest that the situation will likely change. But in Niger, even if the party loses the governorship, Buhari may still carry the day. In the North-East, with the exit of Senator Bayero Nafada from the APC, APC may find it difficult re-enacting the 2015 magic in Gombe State. Findings also show that the party lost Taraba State in 2015, and since PDP still controls the state, it may be impenetrable for the APC in 2019. Adamawa, investigations reveal is another dicey state for the APC. Majority of those who helped it win the state in 2015 have either deserted the party or have been forced away by the party. The governor is still in the APC. But some of his cabinet members have defected to the PDP, yet they have not been fired by the governor. It is uncertain if the APC can afford to go to sleep banking on the state. Buhari and APC are home and dry in Bauchi State as far as the presidential contest is concerned. Yobe, has always been won by the then opposition state, which has now metamorphosed into the ruling APC. Whatever happens in Borno may have effect on Yobe. Borno appears more like a one party state. In 2015, Shettima delivered 473, 543 votes to Buhari, representing about 97 per cent of the total valid votes cast, leaving Jonathan with just 25, 640 votes. The South-South and South-East appears PDP’s fortress, leaving parts of the South-West as a battle ground between the two parties. In 2011, PDP’s presidential candidate, Jonathan, floored defunct Action Congress of Nigeria (ACN) presidential candidate, Nuhu Ribadu, in most South-West states, including Lagos, with the exception of Osun State, where the governor, who had just been sworn in then, needed to prove a point. But if the outcome of the Osun and Ekiti governorship elections are anything to go by, pundits say, the PDP candidate would put up a good fight in the two South-West states. But for the virulent letters from former President, Chief Olusegun Obasanjo, to President Muhammadu Buhari, warning him not to contemplate seeking a re-election, Saturday would probably have been a smooth sail for Buhari. This is not the first time Obasanjo would oppose or criticise sitting Nigeria’s leaders, since he left office first as military Head of State in 1979 and later as a civilian president in 2007. He criticised Alhaji Shehu Shagari, who took over from him. He also criticised Buhari as military Head of State. Again, when the military president, General Ibrahim Badamasi Babangida (retd), unleashed his Structural Adjustment Programme (SAP) on Nigerians, Obasanjo was up in arms against him and his policies, urging IBB to give SAP a “human face.” When the late General Sani Abacha came on stage, Obasanjo was all out firing from all cylinders. Unlike IBB however, Abacha could not tolerate Obasanjo’s criticisms and it did not take long before he was sent to the gulag on the allegations that he was plotting to overthrow the Abacha government. Abacha’s death changed the whole story and Obasanjo regained his freedom and went ahead to win election in 1999 as a democratically elected president. Eventually Yar’Adua died later that year, and his second in command, Goodluck Jonathan stepped in. But in the run up to the 2011 election, there was groundswell of opposition against Jonathan, especially from the North, as the region insisted that it should be allowed to have a go at the presidency again. Obasanjo again stepped in and resolve the issue in favour of Jonathan. He rallied support for Jonathan, same way he did for Yar’Adua. In the end, despite the religious and ethnic sentiments played up against Jonathan in the North, Obasanjo assembled his army of supporters in the North, led by Alhaji Sule Lamido (Jigawa), with support from Aliyu Wamakko (Sokoto) and Murtala Nyako (Adamawa), all of whom were serving governors at the time, to lead Jonathan to victory against Buhari, with a wide margin. Before the election, Obasanjo had on the day Jonathan emerged as PDP’s candidate at the Eagle Square in Abuja, announced that Jonathan would be doing just a term. Meaning, he won’t be seeking a re-election. But by 2012, Jonathan left no one in doubt that he was going to seek a re-election. By December 2013, Obasanjo took his pen and paper and wrote a 18-page letter to Jonathan, accusing him of decimating the PDP through his determination for a second term against earlier promise of serving one term. He wrote to Jonathan 14 months to the presidential contest, which was later shifted by six weeks. Although Jonathan dared him, today Jonathan appears to know better. Obasanjo after defeating Buhari in 2003 and assisting two other candidates to defeat him in 2007 and 2011, shifted support for Buhari in the run up to the 2015 contest, where Buhari, after three previous failed attempts, emerged victorious. Today, Obasanjo is backing Atiku against Buhari. Like he did to Jonathan, Obasanjo’s letter to Buhari also catalogued his misgivings of the Buhari’s government, accusing the president of nepotism, buck-passing and lacking knowledge of internal politics. His letter to Jonathan was 18 pages. The one to Buhari is also 18 pages. Obasanjo’s position, it was gathered, no doubt changed the direction of things in the polity. But Buhari, like Jonathan has decided to ignore him and he is going the whole haul. So far, since 1999 to date, the only political battle Obasanjo has ever lost was his attempt to seek a third term; otherwise he has successfully prosecuted and won convincingly all political battles, especially presidential contest since 2007 after leaving office. Will 2019 be different? A former Director-General of National Maritime Authority (NMA), Galadima, who hails from Yobe State, has been with Buhari from 2003 when he first contested for the presidency. He was for a long time the Secretary of the Buhari Campaign Organisation. In 2007, when Buhari again ran on the platform of the defunct All Nigeria Peoples Party (ANPP), he was the secretary of the party’s presidential campaign organisation. In the build up to the 2011 election, he moved out of ANPP with Buhari to form the Congress for Progressives Change (CPC), where he later emerged as the national secretary. Galadima and one Sule Hamman, who was also very prominent in the Buhari Campaign Organisation (TBO), were variously accused of being responsible for Buhari’s three previous failed presidency attempts. Although, he was part of those who signed the APC merger document on behalf of the CPC, he parted ways with Buhari shortly before the party’s presidential primary in 2014. He backed the then Kano governor, Rabiu Kwankwaso. Before then he had served as the National Financial Secretary of the defunct National Republican Convention (NRC) from 1992 – 1993. He has been speaking forcefully against Buhari’s return. Hunkuyi is a household name in Kaduna politics. He is currently representing Kaduna North Senatorial District. He is also seeking a re-election to the Senate, now on the platform of the PDP. He was one of the brains behind the emergence of the first Christian governor in Kaduna State through the ballot in 2011. His support for Nasir El-Rufai before and after the primary election ensured victory for El-Rufai in 2015. Today, he has parted ways with El-Rufai, and has since become the rallying point for the APC members in the state who are opposed to the governor. Kwankwaso is a household name in Kano. A former governor, who now represents Kano Central in the Senate; his about two million votes to the APC and Buhari in 2015 was a major decider in that presidential contest. His exit from the APC would certainly affect the fortunes of the party in the state. Buhari may eventually win Kano, even without Kwankwaso’s support, but certainly not with the same margin with which he won the 2015 presidential contest. Aminu Tambuwal is the current governor of Sokoto State. He is a former Speaker of the House of Representatives. He defected from the PDP to the APC. But he is back to the PDP. But Aliyu Wamakko, former Sokoto governor, now Senator, who was initially part of the aggrieved members of the APC planning to defect, has however remained in the APC. He supported Tambuwal to win the contest in 2015; but the two of them will test their political might this Saturday. He is the current Senate President. 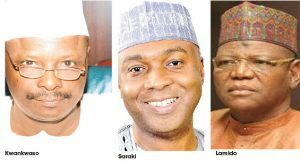 He became Senate President because PDP senators preferred him to his rival, Senator Ahmed Lawan. He appears to still hold the ace in Kwara. He could also influence voting pattern in one or two states in the North-central. There are five states that appear to be the real battle grounds. These sates are Bauchi, Lagos, Kaduna, Kano and Jigawa. And because in Nigeria, there are no serious ideological divide, what divides the country is ethnicity and religion. These two factors will play decisive roles in these states. Will the election be free and fair? Most politicians and political parties have been raising issues about the credibility of the presidential election. The PDP and APC have been accusing each other of rigging plot. However, INEC has assured that it would do its best to ensure free elections. Buhari has also given the same promise. The international community, including the United States, United Kingdom, the European Union and others have also raised issues about the credibility of the polls, charging the federal government and INEC to ensure the votes of Nigerians count. Pundits say that if the elections are free and fair, the will of Nigerians will prevail. They believe that in the absence of fraud, the election result will be tight, with the difference between the scores of the winner and loser low.